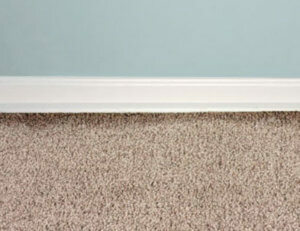 You have probably noticed the lack lines that sometimes appear in carpet along baseboards or doorways. These lines are called filtration lines because the soiling is caused by air passing through the carpet as it trying to filter through the crack between the carpet and the baseboard or the closed door. This buildup occurs over a significant amount of time and isn’t typically noticed until a large buildup accumulates. This type of soiling is difficult to remove because the soil particles are so fine. They penetrate deep into the carpet fibers, sometimes even into the backing of the carpet. Can it be removed? Sometimes. With special products, time and effort, reasonable results can be achieved, especially if you call an expert like North American Chem-Dry. To help prevent filtration soiling, vacuum and wipe the edges of the carpeting on a regular basis. The edges can be difficult, so use an attachment to get all the way to the edge of the carpet. You can also wipe the wall or baseboard with a damp cloth to remove dust build up.